Cool, hip and unique. This was "The Man from U.N.C.L.E." and especially its music! The Jazz from U.N.C.L.E. Live in Concert album is the brainchild of producers Robert Short and Jon Burlingame. Recorded live at "The Golden Anniversary Affair," the fiftieth year celebration of the "The Man from U.N.C.L.E." TV series, it consists of 14 tracks performed from the original sheet music used on the TV series and interpreted by "The Summit Six Sextet," a band of top industry pros brought together to create this once in a life time performance. Each track was carefully selected to capture the essence of the series and showcase the talents of the series most iconic composers Jerry Goldsmith, Lalo Schifrin, Gerald Fried and Robert Drasnin. "Without a doubt the performance of the sextet combo on Saturday evening was the prefect ending. The U.N.C.L.E. theme music is certainly well known, but I never fully appreciated the more subtle qualities of the series' scores until I heard them performed live and on their own. It was clear to me that many of the incidental and background music cues, often dismissed as undeserving of serious attention, can easily stand on their own merits. I suspect that Jon Burlingame is largely responsible for this. The musicians were exceptional". 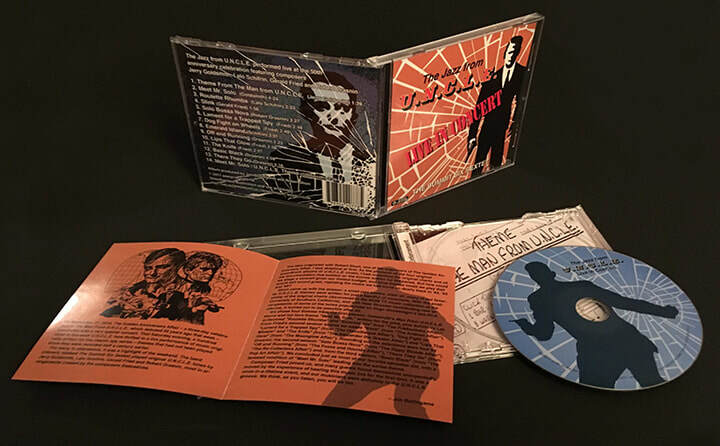 "Got my UNCLE CD today, listening to it and am mightily impressed with sound quality, performances and packaging. Take a bow". "Mission Accomplished Robert. Listening to the CD as I type... The mix takes me right back to that glorious night. Thanks to Robert, Jon and the musicians". "I was delighted to find this in my mailbox tonight, and I am one very happy customer! You guys put together a terrific album... of course! Thank you very much for making this a reality!" CD arrived. Thanks! These are great! Got my copy yesterday, and it's wonderful! "The Jazz from UNCLE has arrived in Ireland! Received my copy yesterday and its been playing ever since. Absolutely love it!!" Awesome disc, if you don't have a copy you must add this to your collection. Cool Show! Cool Jazz! Cool Album! Each track was carefully chosen from some of the most memorable cues used in the series, so come along and join those two indomitable secret agents, Napoleon Solo and Illya Kuryakin on their next international adventure as you experience The Jazz from U.N.C.L.E. Live in Concert. ​Jon Burlingame, Robert Short and composer Gerald Fried. 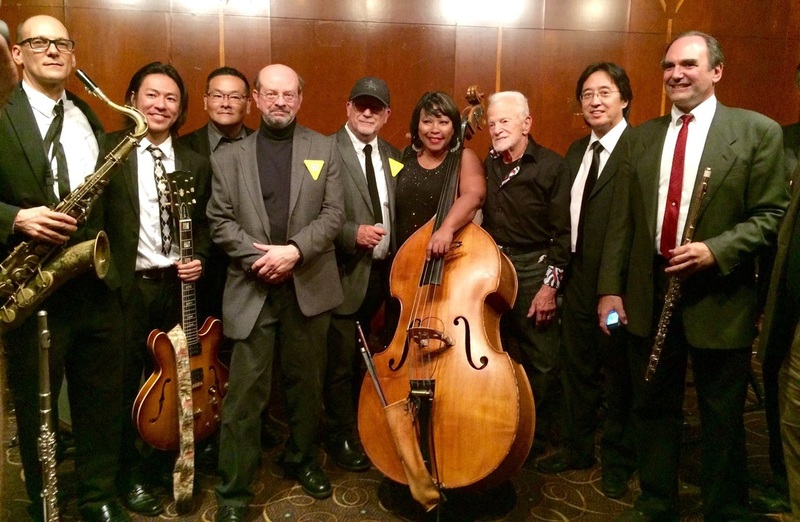 Steve Rosenblum, Yu Ooka, Dean Koba, Jon Burlingame, Robert Short, Nedra Wheeler, Gerald Fried, Dave Iwataki, David Lamont. without whose assistance this album would not be possible.